The summer holidays are finally here and there has never been a better time to experience all the fantastic day-trip locations the UK and Ireland have to offer. From the top of Scotland to the white cliffs of Dover, there are day trip destinations across the country that the whole family are sure to enjoy! The Eden Project is composed of two artificial biodomes, one with a Mediterranean climate and the other with a tropical climate. Each dome contains thousands of plants from all over the world. The Project is a great place to visit when the weather is less than ideal, and throughout the school holidays there are a number of fun family events and activities to take part in. Opening Times: These vary over the summer period so check out the Eden Project website for the opening times on the day you visit. Top Tip: Dogs are welcome but they are not permitted in the indoor sections of the Project. Blue Forest designed and built the Enchanted Village treehouses. Alton Towers may well be the UK’s most famous theme park, and the park has been a firm family favourite since opening in 1980. Several of the rides are quite extreme, with a height restriction of 1.4m, and may be more suited to older children. 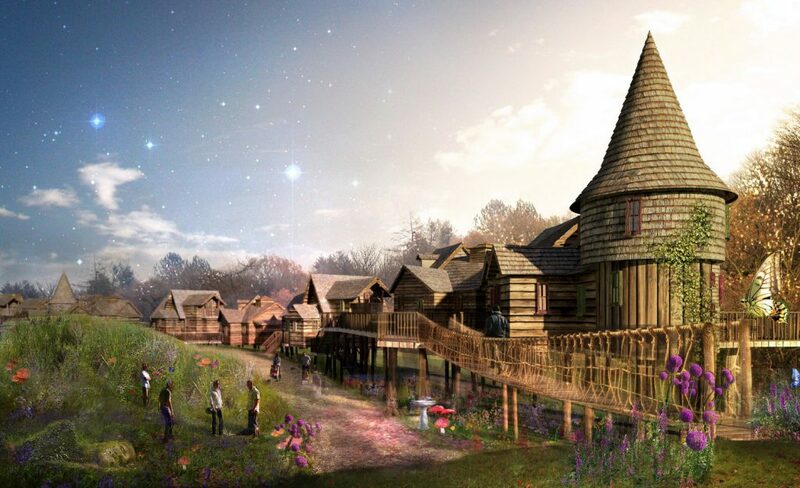 This shouldn’t put off younger families, there are plenty of rides for smaller children, and families eager for a really special weekend trip can stay in the Enchanted Village treehouses and woodland lodges. Top Tip: Taking in your own drinks and snacks will help avoid spending too much on pricey park food! Pensthorpe Natural Park is a great place for families to visit and enjoy exploring the great outdoors. There are adventure play areas, natural trails and beautiful gardens to enjoy as well as a range of summer events. The area plays host to a huge range of local wildlife, and places great importance on preserving the habitats of the birds and animals that live in the Natural Park. Top Tip: Check out the huge WildRootz play area which includes an 11m high slide tower!. The Birr Castle treehouse, built and designed by Blue Forest, is the tallest treehouse in Ireland. Birr Castle was an important part of Ireland’s scientific past, and remains immersed in its historical roots. 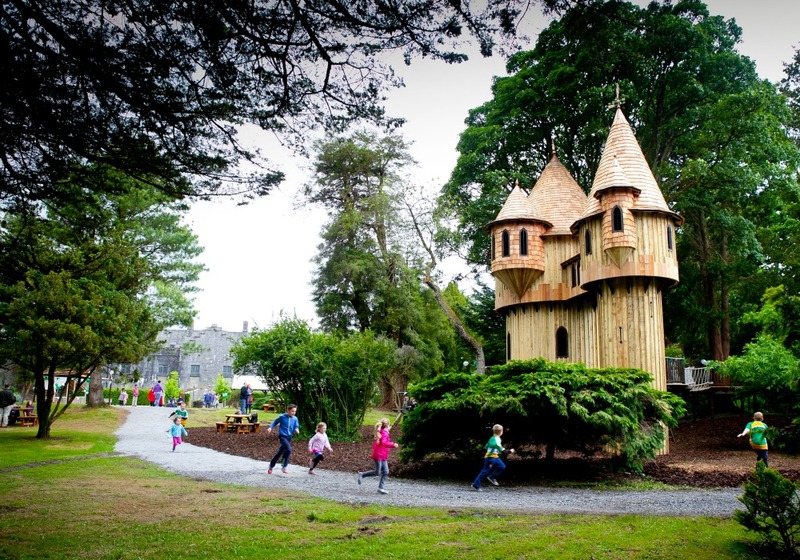 The gardens cover 50 hectares, play host to a number of rare tree species and include the tallest treehouse in Ireland. The castle itself isn’t open to the public, but visitors will have more than enough to do visiting the impressive and picturesque grounds, the interactive science centre and the “Leviathan” telescope (formerly the largest telescope in the world). Top Tip: See if you can find the oldest wrought-iron bridge in Ireland hidden in the gardens of the castle. Dinosaur Adventure Park is just a half hour drive from Norwich and sure to be more popular than ever due to the recent Jurassic Park film remake. There are a number of attractions in the park, including the dinosaur trail and jurassic skywire, as well as a coffee shop, diner and tea room for hungry hikers to take a break. Top Tip: While all ages might enjoy the park most of the attractions are aimed at children under the age of nine. Bodnant is a large, picturesque garden in North Wales with breathtaking views across Snowdonia national park. During the summer holidays they have a variety of events planned including nature trails around the gardens, storytelling, falconry and “hunting for dragons”. The pristine green lawns, small valleys and wild gardens can be explored for hours and there are a number of family friendly facilities. Top Tip: The garden is beautiful all year round but really blossoms in the summer, so don’t forget your camera! Conwy Castle is a hugely impressive medieval fortification on the north coast of Wales. Built in the 13th century, the castle is a World Heritage Site and a fantastic place to combine some history with a great UK day out. The inside of the ruins is a maze of paths, bridges and corridors that kids and parents alike will love exploring. Top Tip: As the castle is on high ground access is restricted for wheelchair users, and those with a buggy would struggle too! Belton House is a historic country house set in beautiful grounds, with a maze and an adventure playground for the kids. An hour’s drive from Nottingham, Belton House is one of the best historical attractions in central England, and visitors can combine learning about its rich history with a fun day of exploring the gardens and parks around the building. Top Tip: Fans of the iconic Pride and Prejudice scene involving Colin Firth and a wet shirt may be interested to know that the 1995 adaptation was filmed at Belton House.